**NO Birthday Parties will be scheduled during the summer months (May 25th – August 10th) due to our set-up for summer camp. We are sorry for the inconvenience. Let WGV Gymnastics make your child’s next birthday party stress free! 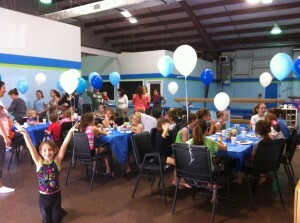 Our coaches will handle every aspect of your party so you can relax and enjoy your child on their special day! *Tipping the coaches is not expected, however, you are always welcome to do so if you feel inclined to. Leotards are fine for those that have them. What could be more exciting than coming to WGV Gymnastics to experience the trampoline, foam pit, rings, bars, beams, and other equipment in gymnastics. We strive to always provide a special and memorable activity that is fun and instructive. Field trips are great activities for playgroups, homeschool groups, daycares, youth groups, sports groups, special needs groups, school groups, etc. Bring your group to WGV Gymnastics to experience an action packed gymnastics themed field trip. The children will be able to enjoy fun activities that are challenging to your group.